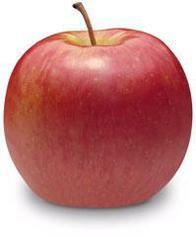 Fuji apples have a dense flesh that many consumers find to be sweeter and crisper than other varieties. It is one of the sweetest apples on the market today. Fuji apples also store very well, with a long shelf life, even without refrigeration. Fuji apples were developed in Japan in the late 1930’s , and are actually a cross between two American apple varieties - Red Delicious and Virginia Ralls Janet. This variety first appeared in the U.S. market in the 1960’s, and continues to be popular with consumers.